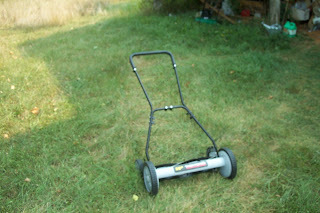 Quick because using a reel mower seems to take only a little getting used-to: I learned within a few feet what the mower wants to do, what it doesn't want to do, and how to respond to each. Nor should the grass be mowed in its current desiccated state. I've seen it dryer here, but only once in the last twelve years. The mower sounds wonderful -- whitttrrr whitttrrr -- as the reel spins, but the grass sounds like ice crunching beneath your feet. My neighbors are cutting their corn already, in hopes of cutting their losses. Twenty days or so since there's been any rain, and not much to speak of in the twenty days before that. But when the rain does return, and the grass gets some life back in its blades, the blades of this new mower will be ready. I'm thinking of calling it Mo.